Greetings glow enthusiasts! As of late, people seem to be getting quite confused about the differences between parallel EL panels and split EL tape. We have been getting so many inquiries, I've decided to just create an all inclusive EL PANEL GUIDE! So here we go! Parallel EL panels are flattened electrodes sandwiched together, and use a technology very similar to EL Wire. So similar in fact, that you can interchange parallel inverters and EL wire inverters freely, without losing any glow. They are produced using a screen printing process, which is nice because you can add animated effects to the panel, something that you cannot do with Split EL panels. The busbar in parallel panels surrounds the panel, and excites the phosphor causing it to glow. This allows for the animated effects we spoke of earlier, but also means that you cannot cut parallel panels. These panels still work wonderfully for signs though. You can easily create a cheap glowing advertisement using one of our Parallel EL Panels, and vinyl. Cover the panel in vinyl, and cut out the portion that you want to shine through. 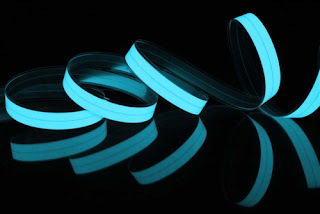 By creating a vinyl negative, a glowing sign is really quite easy to make. Parallel EL Panels have a lifespan of 5,000-7,000 hours depending on the voltage the panel is run at, the enviroment the panel is placed in and a couple of other factors. As you use your panel the phosphor(the element within the panel that glows) degrades with use, UV exposure, as well as exposure to the elements. The better you care for your sign, the longer it will last. If you are interested in designing your own custom panel, feel free to send us an email at info@ellumiglow.com. Custom animations, multiple colors, and any size or shape you desire can be created by our design team for your business or project. Split EL Tape has a lower operating frequency than EL wire and Parallel Panels. This means that split tape can run for can from 8,000-10,000 hours, while actually glowing brighter than parallel panels. And while all EL technology is made for indoor use, the thicker plastic sheathing and aluminum conductive backing make Split EL Tape outdoor friendly. For permanent outdoor installations we suggest adding the outdoor grade UV Inhibitor; this will greatly extend the life of your panel, and allows for applications such like billboards, outdoor architectural lighting, etc. Split EL tape is produced using a roll to roll process rather than screen printing. This leaves a small scribe line running through the center of the panel, that can be thought of like the bus bar. Since the scribe line runs through the center of the panel rather than surrounding it, Split EL tape and panels can be cut into any shapes desired with a regular pair of scissors, so long as you do not cut through the scribe line. If you do, everything after that cut will cease to glow, unless another connection to the power source is made. If you do decide to cut your tape, be sure to seal the edges with clear scotch tape, glue, or anything else that would keep the elements out without inhibiting the glow. Split EL Panels can be used for pretty much anything, so long as the scribe line running through the center of the panel is not cut or crossed. 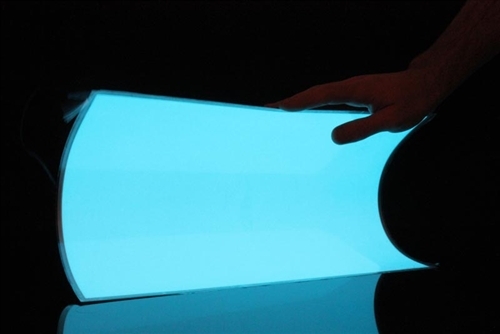 EL Panels and tape offer a uniform glow across the surface, a long lifespan, and is the worlds least expensive lighting source per square foot.